I was in Sungei Buloh Wetlands Reserve today with Tammy and Ivan, the Anniversary Walk project mangers. The heavy rain had not let up since morning and when our visitors eventualy decided not to come down, I encouraged them to stay warm instead! That left me in the unusual situation of having a casual stroll in the park! It is always enjoyable watching wildlife in the rain. The relative absence of weekend crowds made the reserve even more conducive for wildlife and the poor light eliminated any serious attempt at photography, making it even more relaxing! 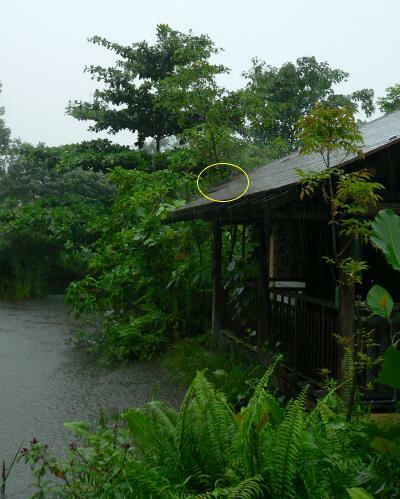 Monitor lizard on the roof! Sheila on duty at the Visitor Centre counter, told us about a young monitor lizard (Varanus salvator) that she had heard clattering on the roof. Monitor lizards are good climbers and it is not surprising to see the young, lighter ones at least, up a tree. But on the VC roof? It was still there, to our delight, and we pondered with other visitors how it was going to get down. We ventured out through the downpour to the bridge and main hide. The river was all brown from sediments pouring out into the Western Straits of Johor. Egrets and herons were actively stabbing small fish along the river edge and in pools. Inter-tidal waders scurried around for food in shallower waters or on mudflats in ponds - a scene as busy as a bus interchange! Most of the birds seemed almost oblivious to the downpour, except for a row of Painted Storks (Mycteria leucocephala). These frequent visitors are reportedly a flock of residents from the Singapore Zoological Gardens. Yup, the same ones you see free-flying there! They stood with feathers all tucked in until the rain lightened up. Then they began hunting, trawling the water with their long, slightly curved beaks. Sudden movements of the head indicated the snapping of beaks, which they did when they detected prey, the small fish in the water. They were watched comfortably with a 10x binoculars but the 20-60x scope we took turns at provided for some breathtaking views. Having read the Habitatnews post, Tammy was hoping to see a crocodile. After a few blanks, she called out something looking too active to be a monitor lizard. And so the three of us got to enjoy the scene of an otter twisting and turning in the water before scampering up a muddy slope and disappearing into the vegetation. Well, we can safely tell casual visitors that Sungei Buloh is well worth a visit even in a downpour, and for plans to go ahead rain or shine. There are enough hides peppering the reserve to allow for a walk in the monsoon. Just ensure your umbrella is proof from being blown inside out!